We are committed to ensuring that the Edinburgh Festival Fringe is as inclusive as possible. The Fringe Box Office has staff in place to specifically handle access enquiries and ticket bookings. This service is here to assist anyone with an access requirement to make the most of what the Edinburgh Festival Fringe has to offer. Would like to book specific accessibility services eg a hearing loop, audio description headsets, captioning units or seating in relation to the location of the BSL interpreter. Requires specific accessibility information for each venue. Requires extra assistance when at a venue. Requires a complimentary personal assistant ticket to attend a performance. If you would like to book a ticket, please include the following information in your email. The show you would like to book. The date, time and venue of the show. What you need to be able to access the performance. A phone number we can contact you on if you would like us to phone you. You can register with us as an access user to book free personal assistant tickets online. We are working towards online booking for all customers including wheelchair users, however at this point we are not able to offer the online booking for wheelchair users. The following collection points have level access provisions and are managed by Fringe staff. The Fringe Shop is wheelchair accessible, with a power assisted door, hearing loop, and dropped counter. The Fringe Box Office has level access via a steep slope, a hearing loop, and a dropped counter. The Virgin Money Half Price Hut has a hearing loop. There is no dropped counter, but staff assistance is available. Let us know on the Welcome app if you are coming to the Fringe Shop or Box Office and would like to request assistance. Please note that although the Captioning, Audio Description, Signed and Relaxed Performances may have many performances throughout the festival, the accessible performances are only on the dates shown in the access performance listings. These are updated regularly so be certain to check back for the most up-to-date information. If you have a specific access requirement, remember to book using the Access Bookings team. The advanced search filters on edfringe.com and the Fringe app can be used to filter all shows by access provision. You can apply the following filters or click on the quick links below to view results. The Mound: This is the location of the Half Price Hut, which sells half-price tickets on the evening before and the day of the performance for shows that have chosen to be included. There is a Hearing Loop, and although there is no dropped box office, staff assistance is available, tickets can be bought between 10:00 to 21:00 from 8 August to 27 August. Ticket collection services will be running from 3 August. By bus - Lothian Buses run services from all over the city to Princes Street, there is also the tram service which runs there from Edinburgh Airport. By train – Get the train to Waverley Station and exit onto either Waverley Bridge or Princes Street. Go west past the Scott Monument and the Mound is located next to the Scottish National Gallery. The High Street: Here you will find the main Fringe box office, which is a level access box office with dropped counter and is equipped with a Hearing Loop. The Fringe box office is open between 09:00-21:00 from 30 July to 27 August. By bus – There are several buses services running along the North and South Bridges. Disembark from here and it is a short distance to the High Street. Route 1 – Exit onto the Market Street or Waverley Bridge and travel up Cockburn Street, this will take you directly to the east High Street entrance. Route 2 – Exit onto Waverley Bridge, turn right onto Princes Street towards North Bridge, from here it is a short walk to the east High Street entrance. This is longer than the first route but is also not as steep as the first, so may suit wheelchair users or those will physical impairments. For up to date travel information, visit www.lothianbuses.com or www.scotrail.co.uk. There five Changing Places in central Edinburgh during August. These are accessible toilets with an adult-sized changing bench and hoist, for people who are unable to use a standard accessible toilet. The Booking Office Pub, Waverley Bridge, EH1 1BQ, 06:00 – 00:00. 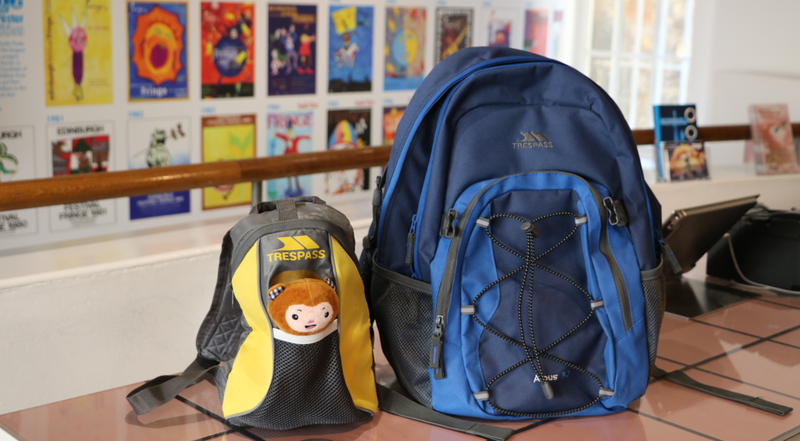 The Fringe Society has a number of sensory backpacks which are available to borrow (free of charge) for children and adults on the autism spectrum, to help make your Fringe experience as enjoyable as possible. Each backpack contains a fidget toy, earplugs or ear defenders, a photo story describing the Virgin Money Street Events (download the social story .pdf), and a list of relaxed performances at the Fringe. Small backpacks also include a soft toy. Backpacks and ear defenders should be returned to one the pick up locations, but you are welcome to keep the other items. Backpacks are available on a first-come, first-served basis. To borrow a backpack, please bring a form of photographic ID with you. Dates, times and locations for borrowing a backpack for the 2019 Fringe will be listed here once confirmed. We are grateful for the support of the Edinburgh Festivals 70th Anniversary Legacy Tourism Innovation Fund, Trespass, Edinburgh Trams and Deaf Action in providing sensory backpacks and BSL interpretation. Let us know on the Welcome app if you are coming to the Fringe Shop or Box Office and you require assistance. Search for a parking space for a disabled person on this map from the City of Edinburgh Council. Lothian buses aim to make travel easier for everyone, including passengers with disabilities and those traveling with young children. We are delighted to once again be hiring a mobile Changing Place from Mobiloo for the Fringe. This will be located on the corner of Windmill Street and Chapel Street (EH8 9LE). Artlink works towards making the arts accessible to people with experience of a disability. The Arts Access service creates links between people who want to discover and enjoy the arts in Edinburgh. The service works to ensure that the trickiest part of an Arts Access outing is choosing where to go. They provide ‘What’s On’ information, book tickets, match members with volunteers and organise transport. Gig Buddies is a befriending project in Midlothian, which aims to link music fans who have a learning disability with volunteers who share a common interest. Many Gig Buddies enjoy coming to a variety of shows at the Fringe.